I first saw these images, of Canadian House & Home's assistant style editor Michael Penny, yesterday while breezing through my blogland daily reads. I thought they were pretty, flagged a few and whized right on by, not even remembering where I saw them. But as I was browsing the eye candy on CH&H's website last night, I came across them again and was floored with all the brilliant design details that I completely overlooked on first glance. Yet another reminder that life is in the details and that I might be loosing ground on my ever constant struggle to be truly present throughout the day. Luckily...you can view the online gallery again and again to catch all the goodies you missed the first time around...gotta love this newfangled internet thing. Fabulous Detail: A deft mixture of patterned (maybe slightly floral, I can't tell) wallpaper with a sleek modern light fixture and a hint of natural texture thrown in with the accessories. 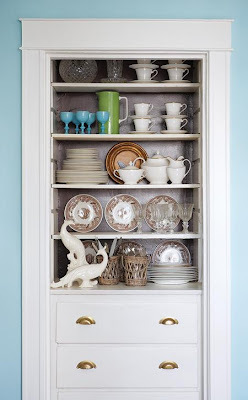 Fabulous Detail: Layering of dishes with different colors and styles to make a visually organized and still totally work-horse functional cabinet. 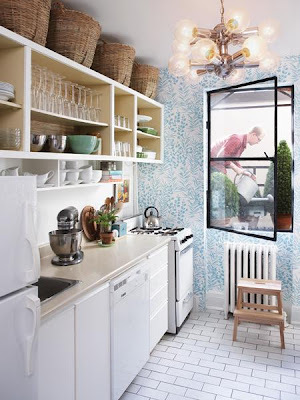 Throwing in a few decorative pieces in the same color scheme as the dishes to add visual interest and humor. And again, a smidge of texture in the accessories. 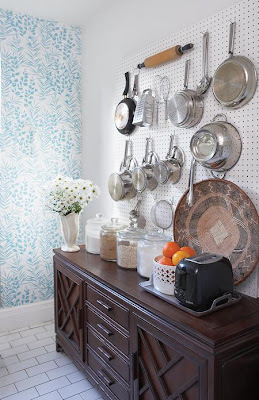 Fabulous Detail: Cookware organized by size gives this peg board a sense of order. And placing an everyday, not so fabulous object, like a toaster on a silver tray makes it instantly more chic. 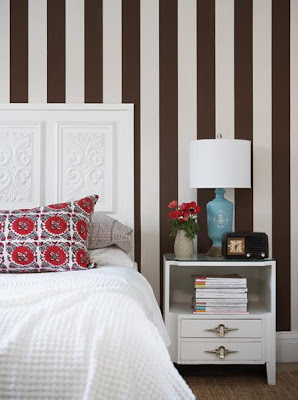 Fabulous Detail: Keeping other details in the room all in the same color scheme (white), but all with some kind of texture (bedding, headboard, vase) makes the stripes the focal point, but keeps the room balanced. I'm glad I'm not the only one who does this. :) I try to take everything in but just get the big picture at first. Then I go on the detail hunt. That's why it takes me so long to get through magazines and catalogs. And delightful blog posts.